zfs mount -a attempts to automount any recognized zvols, and zfs mount just lists mount points available in case you were wondering. Internet points for you... Well done sir! So now i just press OK and reboot my system and all my data should become visable? should be, yeah. 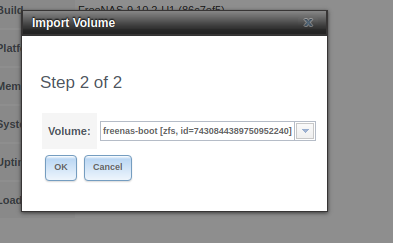 Might want to check the freenas documentation on finer details, i usually only work with freebsd. I have tried rebooting 2 times now. Still can't see my volumes... Any idea of whats going wrong? run zfs mount again, see if the volumes stayed mounted. OK, so they don't show up anywhere? if they list with zfs mount, that means they're mounted. They show up in the shell but i can't find the volume in the "Import volume" option anymore. If it would be easier, we can jump to discord so that you can see the screen? so they don't show up in "view volumes" in the storage > volumes > view volumes? are all the disks in the raid1 present in view disks? yes. "tank" is zfs nomenclature for "volume"